The app is powered by mobile payments network LevelUp and can be used at the thousands of LevelUp merchants nationwide. 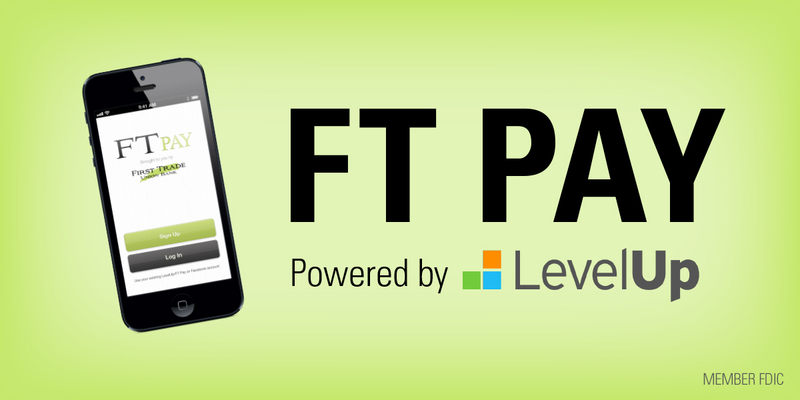 The new FT Pay app is now available for free download from the iTunes App Store and Google Play. FT Pay combines the best of LevelUp’s award-winning payment and loyalty platform with First Trade’s existing mobile banking applications, giving FT Pay users the ability to pay with their phones at any LevelUp merchant location while unlocking LevelUp credit and exclusive First Trade offers in the process. First Trade will match the savings from merchant discounts and deposit up to $25 as a new account bonus directly into new customers’ FT Checking accounts, while existing bank clients can increase their savings by sweeping merchant credits into their savings accounts. The new mobile payment app integrates with the First Trade Union Bank debit card, and any non-First Trade debit or credit card. The exclusive FT Pay “Vault” reward feature will continue to benefit businesses in the LevelUp network as First Trade will create ongoing, exclusive offers to drive more loyal customer traffic. This latest technology roll out from First Trade also marks the kick-off the market-facing promotional campaign. Stackpole worked closely with First Trade and its technology partner, LevelUp, to develop a fully integrated program that leverages a high impact mix of digital and non-digital channels, trade and consumer PR, and events that target the greater Boston and New York markets.